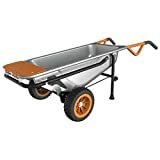 The cool new WORX AeroCart is an 8-1 multi-functional wheelbarrow, dolly, cart, and more. One-wheeled wheelbarrows tend to tip over, but this unique carrier has two oversized, balanced, and flat-free tires placed directly beneath the load for a balanced center of gravity and maximum leverage that reduces the lifting force by up to 4x. 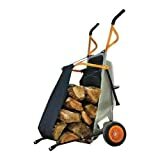 It can also easily transform to become a hand truck for lifting and moving heavy items and includes a mesh rock lifter, a potted plant moving strap, a cylinder holder for round items, and a bag holder for holding open lawn and leaf bags as well. It's narrow in size to help you easily get through doorways and fence gates and stores compactly to save valuable garage or shed space. If that's not enough for you, there are also optional accessories to it make a snow plow and rolling wagon too. Great all-purpose solution.